Applications to study for Masters and research degrees need to be made directly through the University. Please apply via our website, using the online application form. Go to the webpage of the particular course you are interested in and press the ‘apply’ button. This will also give you some supporting information about the application process. Alternatively, if you are unable to access the online form you can call Admissions on 01285 889 912, or email admissions@rau.ac.uk. Applications are welcome at any time during the year (the main application period is between November and May) however it is recommended that you apply as early as possible. Provide contact details of two referees. If you already have the references you can upload them with the application form. Studying for a postgraduate qualification is an extension of your previous university experience. Much of the ways in which you studied for your degree still apply as a postgraduate student, however, the expectations of your performance and levels of independence are increased. It is important therefore that you prepare both mentally and practically for your postgraduate course well in advance of starting. All of our academic activities are therefore geared around the development of your knowledge, intellectual skills and attributes so that you can adapt and grow to meet the challenges of tomorrow. Below are a few pointers to get you started on your postgraduate journey but if you have any questions it’s important that you ask and get the answers. What does the academic year look like? Like most universities, the academic calendar is made up of 30 weeks of timetabled contact time, split across 2 semesters. Each semester has 15 weeks and includes an examinations and feedback period at the end of each one. Week 1 of the academic year starts at the beginning October and there will be a continual run of 10 weeks until the break for Christmas, with the remaining 5 weeks of semester one running through January and ending early February. Semester 2 then begins and runs until the end of the academic year in June, with an Easter break usually at the end of March. 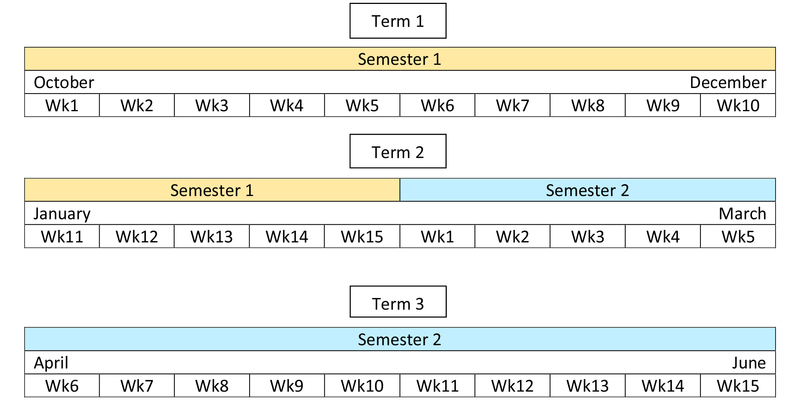 The generic academic calendar can, therefore, be summarised as being 3 terms of ten weeks each which are organised into 2 semesters. If you are a Graduate Certificate/Diploma in Agriculture student you will complete your qualification following the normal academic calendar as described. If you are studying for a Masters qualification you will follow this academic calendar for the taught elements and then go on to complete the dissertation element over the summer months, handing in at the end of September. A Masters programme, therefore, takes a full calendar year to complete. Whilst most postgraduate courses follow this pattern of an October start, for some programmes, there is an option of starting in February and completing in January of the following year. If this is an option for your chosen course it will be identified on the course information pages and discussed at Open Day. As well as the formal teaching activities there is also a Freshers’ induction week which takes place the week prior to Week 1 and is sometimes referred to as ‘Week 0’. It is for students new to the University and is organised by the Students' Union and the University to help new students settle in, find their way around campus, become familiar with key members of the teaching team and Support Services and make friends. There are lots of activities during the day and in the evening and it is often a very full week. More information about your induction week and timetables will be available prior to your arrival. Pre-sessional activities may well be held for a number of courses and you will be notified of this during the application process. They are usually there to ensure that your chosen programme of study is right for you, to bridge any knowledge gaps and to help you acclimatise to the UK university system. During your undergraduate degree, you probably became familiar with many of the methods of delivery and study that we expect you to continue with during your postgraduate course. It is expected that you come already equipped with the basics in academic study, such as the ability to find, evaluate, manage, present and critique research or industry relevant output. There is a greater emphasis on independence and individual contribution towards the topics covered, and so the expectation is that students will actively participate in class-based activities from the outset. Giving presentations, critiquing case studies, using peer-to-peer feedback, working in groups on topical problems and justifying opinions based on the evidence is the norm for postgraduate study. It is not uncommon for students to arrive at a particular postgraduate qualification with very diverse backgrounds, qualifications and experience and we welcome these different perspectives in the classroom to bring a debate alive, however, it does require the student to take responsibility for their own subject knowledge gaps and motivate themselves to fill them. Of course, there will be support and guidance provided for good sources of information, however, it is not expected that these gaps will be specifically addressed within the taught sessions. For most postgraduate programmes, group sizes range between 20 – 100 depending on the course and electives chosen (if relevant). However, alongside the lectures are small group seminars and tutorials where you will have the opportunity to explore key concepts in more detail, discuss topical issues relating to the key themes and undertake practical activities that help set the theories in context. To compliment the lectures and seminars, there may also be practical sessions, laboratory classes, off-site visits, case studies, guest speakers and field trips that are included in your timetabled activities depending on the modules you are studying. Part of the reason for studying at postgraduate degree level is so that you are equipped with the knowledge and skills for a lifetime’s career. It is imperative therefore that you are able to monitor and evaluate your own progress, take responsibility for your own learning and work collaboratively to solve problems. Postgraduate programs allow you the opportunities to refine these skills. Student and lecturer are therefore on a truly collaborative journey as you move through your course and it is only fully effective if both parties are genuinely engaged. To provide you with every opportunity to immerse yourself in the subject we use our virtual learning environment where you can find all of the modules that you are studying that year, as well as a course page for your programme. The module pages contain all of the information relating to that module – the teaching schedule, the learning materials, assessments, online activities, additional resources, which staff members are involved and how to contact them, as well as links to additional external sources of information. The programme page has information relating to timetables, assessment schedules, course meetings and other relevant resources. There are also links to your timetable and the various support services in the university. Just as with your undergraduate programme, there will be periods of time in the week that are not timetabled with taught sessions. This is not ‘free time’! Whilst there may be room in your schedule for outside pursuits, the time in between lectures is there for you to work on assignments, group activities, preparation for lectures and seminars and deepening your understanding of the subject. For every 1 timetabled hour, it is anticipated that on average 2 further hours are spent studying, so make sure you plan your priorities and use this time wisely. Of course there are many other things competing for your time and energy, and we want you to become involved with the social side of university life, but make sure this is not at the expense of your place at university. For every piece of coursework you carry out you will receive constructive feedback not only on the knowledge and understanding of your subject but also how well you have demonstrated the skills and abilities that we are looking for in our postgraduates. These summative assessments contribute towards your final module mark, which in turn contributes towards your end of year mark. Your feedback is provided online, so that you have a permanent record, which is important because when you carry out your next piece of coursework we will expect you to use your feedback to improve. It’s important therefore that you understand the feedback you have been given and ask questions to help develop your understanding. In addition to the online feedback it is highly likely that the lecturer will go through general aspects of the coursework with the whole group during face-to-face sessions or in a one to one, where appropriate. To help prepare for these summative exercises there will be plenty of opportunities to practice the skills required for your assessments and gain feedback on your performance. These formative opportunities are extremely important and are usually embedded into lectures, seminars and the other activities that make up your course. Feedback on these activities is usually continual and in a whole variety of forms – it may come from your peer group, or question and answer sessions, it may be as a result of practicing a skill and testing your abilities, it could be through one-to-one tutorials or exercises set in class. The important thing is to recognise these as opportunities to learn more about the subject, how well you understand it and your ability to apply your developing skill set. When you first enrol, you will be assigned a personal tutor who will meet with you at least once a term, but you can request a meeting at any time. A meeting with a personal tutor offers the chance to talk through issues and may be all it takes to find a resolution for any challenges you are facing but, if necessary, they are also able to guide you towards more specialist services. Student Services encompass a whole host of personal, financial and health and well-being resources that can step in and support you if needs be, and we also have a team of academic support mechanisms to help with disabilities and identified learning needs. This may be help with time management, organisation, note taking or how to structure academic assignments all the way through to specialist support for dyslexia, dyspraxia etc. The important thing is to talk to your tutor about how we might help you and not to stew on worries or problems.